This book offers expert advice from the culinary world's most respected magazine. It features over 125 deliciously recipes, with chocolate, ranging from tarts and cookies to sweets and sauces! A beautiful book with recipes that are suitable for all skill levels. For years, most cooks only worried about choosing between semi-sweet and milk chocolate when whipping up chocolate creations. These days, however, it's vital to know the origins, varieties and unique characteristics of each ingredient to create perfect recipes. The experts at "Fine Cooking" magazine have taken the guesswork out of making more than 125 scrumptious sensations from layer cakes, tarts and pies to muffins, cookies and brownies to sweets, sauces and hot cocoa. Each recipe features must-know tips on choosing and buying just the right chocolate; simple step-by-step instructions and authoritative advice from respected experts. 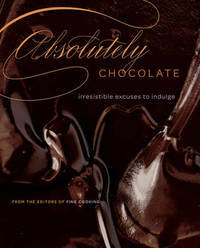 In other words, "Absolutely Chocolate" is absolutely fabulous!